The popular Kaweco Sport range has, until now, always featured a gold nib and furnishings. So, the new Skyline Sport range is causing quite a stir with its silver nib and furniture, alongside a bunch of brand new, gorgeous colourways. 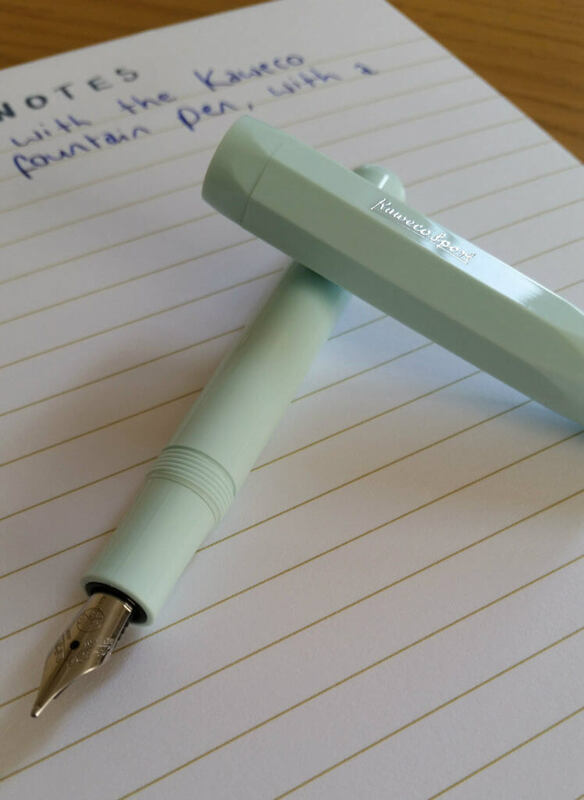 I settled on Mint, with a matching ballpoint pen and mechanical pencil, but it was a tough decision, and not one I took lightly! However, I am happy with my decision, as it is a really delightful colour – modern and very spring/summer. I was already a fan of the classic Sport shape, first established back in 1935. 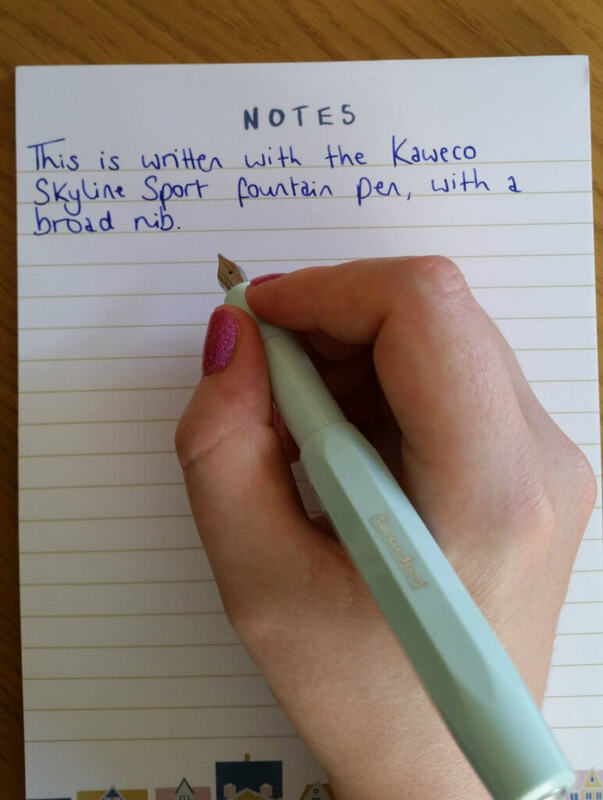 At just 105mm long when capped, the Kaweco Skyline Sport fountain pen is small, yet with the cap posted, it transforms into a full-length pen I could comfortably use for hours (at 133mm). The barrel, at its widest, is 14mm but the area you grip for writing is smaller – the same size as a ‘regular’ fountain pen. Posting the cap makes the pen looks top heavy, but it isn’t as the material it is made from is so lightweight. 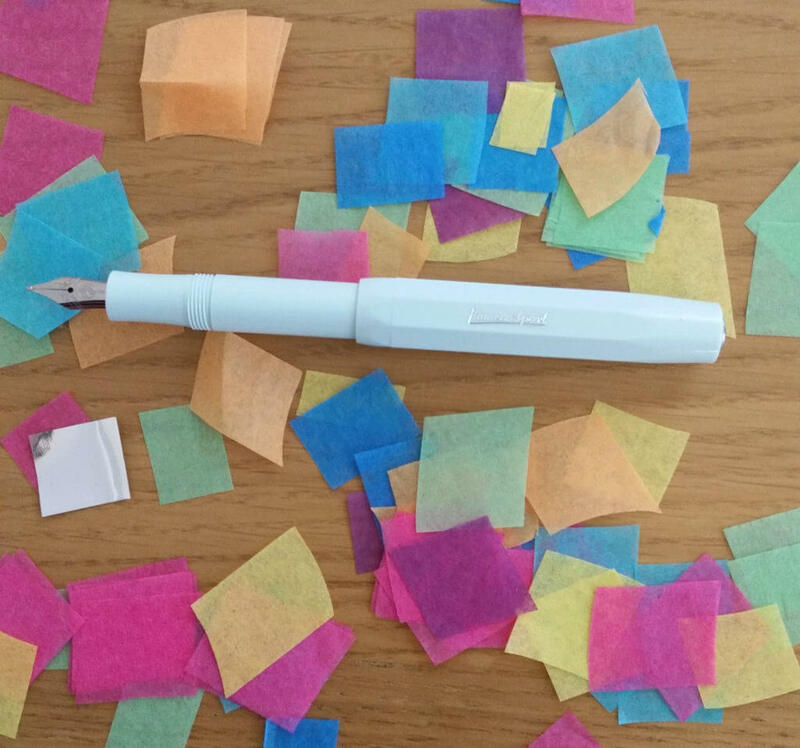 In fact, the pen (without an ink cartridge) weighs only 9g. The cap is twist on/off. Writing with this pen is a joy! 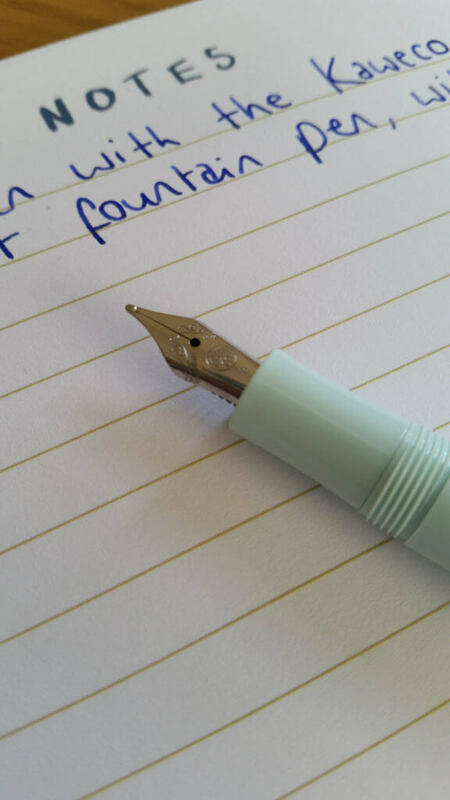 I opted for the broad nib, as I often do, and it is a smooth writing experience, with the perfect flow of ink – not too much, but just enough to keep me going on the page. The silver details on the pen look great too – especially the Kaweco logo on the end of the cap, against the beautiful Mint colour, and the polished stainless steel nib too. You may notice there is no clip on this pen – that is no problem for me, as I enjoy its slick appearance and don’t put pens in my pocket, but if that is something you would miss, you can purchase a clip for it separately. 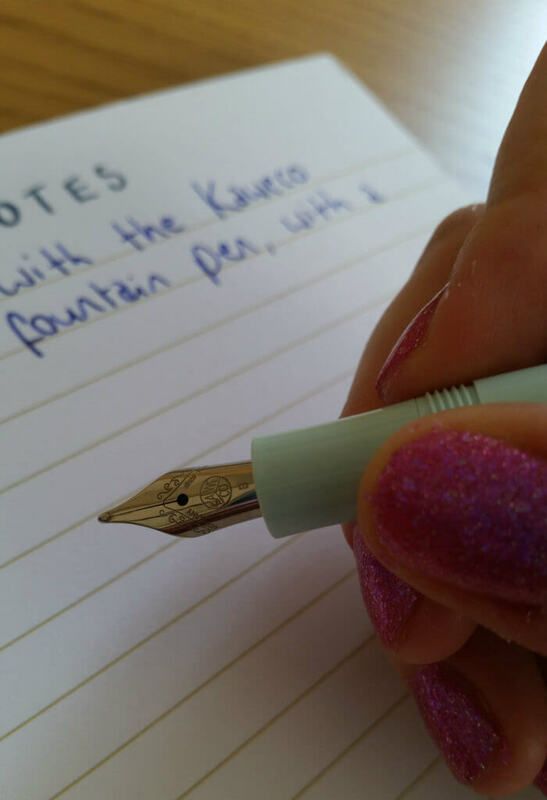 As with the classic Sport fountain pens, this is an affordable, high quality plastic pen which is perfect for throwing in a pocket or bag for on-the-go notes. Personally, I now keep this pen in my handbag for jotting down inspiration for my creative writing during the day. It also comes in handy for quick shopping lists! Overall, I am loving this pen; it’s great value for money, an excellent writer, and a stunning design. 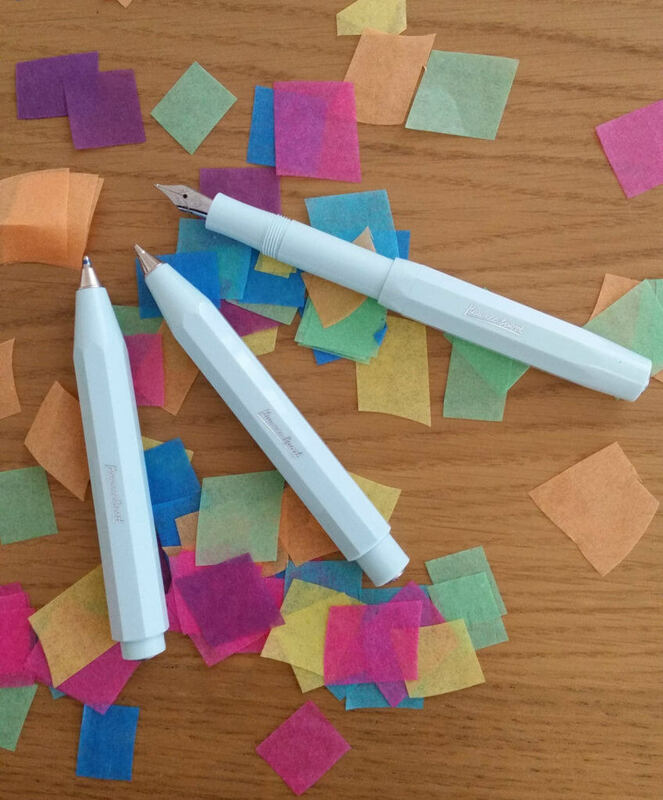 As a long-term stationery lover, I adore working for The Pen Company. My childhood saw me carrying around a little red briefcase covered in stickers and full of pens, paper and other such goodies; my adulthood sees me doing pretty much exactly the same!